Hours: The Royal Gardens are a world renowned center for horticultural studies. An amazing 70 acres of finely cultivated landscaping has fascinated the imaginations of visitors for decades. The Garden is open every day except December 25 and Jan 1 from 10am to 6pm, with earlier closing during the winter months. Rock Garden: The rock garden at the Royal Botanic Gardens Edinburgh was first built in 1871 and has been updated numerous times over the last century. While rock landscaping was a popular garden feature during that time period, a garden designed entirely for an alpine theme was something completely new. 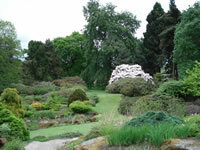 Since its inception, the rock garden at the Royal Gardens Edinburgh has become quite the attraction with visitors. Thousands of plants that are suited to higher elevations and sub-arctic temperatures grace this garden. Chinese Hillside: This garden, opened in May 1997, sits on the south slope and offers visitors a stunning view of Edinburgh Castle. Over sixteen thousand plants are estimated to be planted in the garden, and rather than being confined to specific areas, they have been allowed to grow through the garden at their leisure. Visitors can take a stroll through the many winding paths across the hillside, and take a view of a majestic waterfall that empties into a pond at the lower level of the garden. 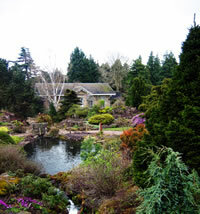 Alpines: The Royal Botanic Gardens Edinburgh boasts one of the finest collections of alpine plants in the entire world. Specimens in this garden originate from all over the world including New Zealand, Scotland, South Africa, and even Arctic regions that are permanently frozen. In the 1970’s the Garden built the Alpine House to help recreate the widely varying conditions that the collections require, and could not be duplicated easily outside. This climate controlled environment is well suited to the diverse needs of its occupants and provides lush foliage and color year round. Queen Mother’s Memorial Garden: Opened in July of 2006 by the Queen herself, this garden has a labyrinth of ornamental myrtle planted at its center, an attractive and common plant in Scotland. The four corners of the garden are planted to represent four distinct geographical regions of the world, Europe, Asia, North America, and the southern hemisphere. At the center of each of these four themed corners at the Royal Gardens lies a specimen tree that is native to that particular region, and acts as the focal point of each display. Glasshouse Borders: The heat generated by the Garden's greenhouses gives their borders a unique microclimate in which semi-hardy plants are able to thrive where they would not otherwise. The borders surrounding the greenhouses are filled with plants related to specific countries, many of which in the southern hemisphere such as a Chilean and South African border garden. Ecological & Cryptogamic Garden: Designed originally to be two distinct gardens, these two unique sites have long since grown together over time, blending their similar styles and plant life into one fascinating display. One half of this garden is woodlands where leaves and broken twigs and branches are left to cultivate cryptogams, otherwise known as fungi, mosses, and lichens. The other half of this interesting display is grassland that is dotted with limestone outcroppings that serve species of grasses and plants that thrive on a more acid rich environment. Scottish Heath Garden: A Scottish countryside in the heart of the Royal Botanic Gardens Edinburgh, this garden was planted first in 1935, and redone again in 1997. Mass plantings of common plants and grasses from the Scottish hills and meadows dot this garden. An old abandoned building was built on the grounds using recycled stone and material from the original garden. The goal was to create a natural environment for plant life, as well as a habitat for wildlife, all while maintaining that traditional Scottish look. Woodland Garden: A wonderful shade garden that is home to a variety of woodland plants and shrubs that do not prefer full sun and open spaces. Started in 1914, many of the plants in this garden offer vibrant color in the spring and summer, and then subdued textures during the fall and winter months. Peat Walls: The walls of this unique area of the Royal Gardens are made from low grade peat and are designed for plants that prefer moist and acidic growing conditions. The peat blocks used to construct these walled wonders only need replaced once every 15yrs, and before they can be planted they must go through a two year sterilization process…talk about commitment! Herbaceous Border: The Royal Gardens is home to one of England’s most impressive hedges of beech trees. Well over 100yrs old, this border is comprised of over 150 trees, originally planted as a barrier between the garden grounds and the pasture beyond that once grazed cattle. Arboretum: Sprawling across the old grounds of the former Inverleith House lays the Royal Gardens’s Arboretum. The collections of trees in this area are representative of century’s worth of scientific exploration, along with the modern importance of ecological conservation. Among the collection of trees visitors will find 35 species of oaks, balsam poplars, maples with their fantastic autumn color, as well as hazels, alders, and birch. Plant Labels: The Royal Gardens prides itself on its detailed database of information on the many plants, trees, and shrubs that are located in the Gardens. This database provides an essential tool for the research and cultivation of the collections, and is the cornerstone of horticultural study within the Gardens.